Optimus Prime redesigned as Volkswagen bus final version. Created in Cinema 4D. 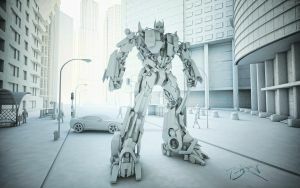 I started with a model of Optimus Prime found online (sorry I don't have the link anymore). I remodeled it quite a bit and in fact the only things left untouched were the hands and parts of the head. I also used elements from car and truck parts models from Turbo Squid [link] in order to model the body. I then sliced up the Volkswagen bus model [link] into various pieces for the arms, legs and chest. Texturing was done primarily with procedural materials to give it an old rusty, corroded look. The hippy flowers paint job was done in Photoshop and then applied to the model in Cinema 4D. Finally, a few post effects (light wrap/glow and a bit of noise) were added in After Effects. The final composite and color correction was done in Photoshop. Okay I saw many forms of prime but this one is awesome! XD JK prime is amazing! He's become an official hippy! Just wait, he'll be using ethanol too.